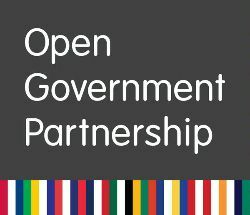 The US has just released its third National Action Plan updating its OGP commitments. 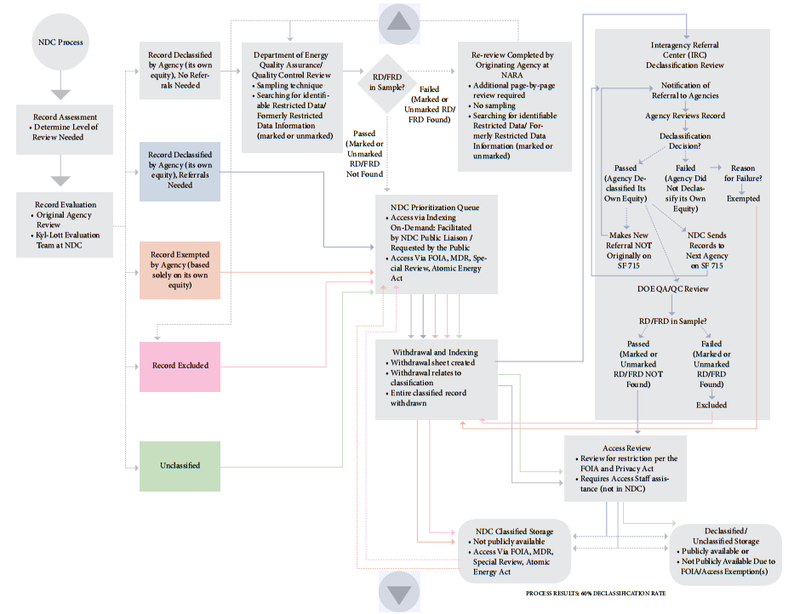 The current process for 25-year automatic declassification review, found in the PIDB’s December 2014 Report. The NAP’s FOIA commitments are less encouraging. The Plan’s FOIA modernization promises focus on building a consolidated online FOIA service, which was promised in the Second National Action Plan, and not delivered. Of greater concern is the accessibility promises surrounding Section 508 of the Rehabilitation Act, which requires that people with disabilities have comparable access to information as people without disabilities. Agencies often complain that making documents 508 compliant, and posting 508-compliant FOIA requested documents on their websites, is too burdensome, and the NAP commitment to developing universally-designed software codes to address accessibility issues may delay agencies compliance with posting these documents online. Hopefully the drafters of the NAP will soon explain why and how this will not be the case. Archive FOIA Project Director Nate Jones noted in an interview with Federal News Radio that while the plan is a positive step, it does not address classified information or the larger problem of whether or not the intelligence community should classify data in the first place. “In the past, [the IC] has needlessly classified information that has been of public interest. This plan, Jones said, does not address that problem and only facilitates the release of information that is declassified.” Jones gave the example of two National Security Agency documents about the mysterious 1961 death of UN Secretary General Dag Hammarskjold, requested by the United Nations, National Security Archive, and others, that the NSA bafflingly still refuses to release, citing harm to US national security. 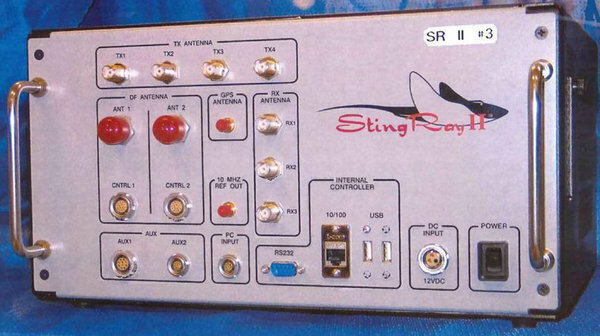 Invoices obtained thanks to a FOIA request show that the IRS purchased Stingray cellphone surveillance devices, bringing the total federal agencies known to use the device up to 13. The instruments are most likely used by the IRS’ criminal investigation division, which is increasingly working with the FBI and other agencies on aggressive drug cases. Obtaining the powerful devices, which mimic cell phone towers and can place a cellphone’s location, “require[s] only a low-level court order called a PEN register, also known as a ‘trap and trace’, to grant permission for their use” – making it likely that the number of federal agencies using the devices will not stay capped at 13. A report issued by the Justice Department inspector general found that eight of the fourteen Drug Enforcement Administration agents involved in a prostitution scandal received bonuses ranging from $1,500 to $32,000, in clear violation of agency policy. More troubling, a DEA internal affairs log released under the FOIA earlier this month shows that agents routinely keep jobs – to say nothing of receiving bonuses – despite serious misconduct. Out of 50 instances where the DEA’s Board of Professional Conduct recommended an employee be fired, only 13 were actually terminated (and in some instances agents were reinstated by the federal Merit Systems Protection Board). U.S. District Court judge Gladys Kessler has shot down the government’s efforts to withhold videos of Guantanamo detainees being force-fed, noting in her nine-page opinion that “What the government is really saying is that its classification system trumps the decisions of the federal courts as to the public’s access to official court records.” The case stems from the Defense Department’s May 2014 admission that it had video recordings of force-feeding Guantanamo detainees in the wake of the detainees’ accusations that the US was manipulating data on inmates’ hunger strikes, including how many times inmates are subjected to force feedings to keep strike numbers artificially low. The court initially ordered the government to turn over the 34 videotapes last May. It’s worth noting that Kessler also ruled last November that the military does not need to modify the way it force-feeds detainees, even though one, Abi Wa’el Dhiab, argued in court that the technique was tortuous. A list of Soviet actions during the War Scare cataloged by the PFIAB’s authors. Each is elaborated upon in the report. 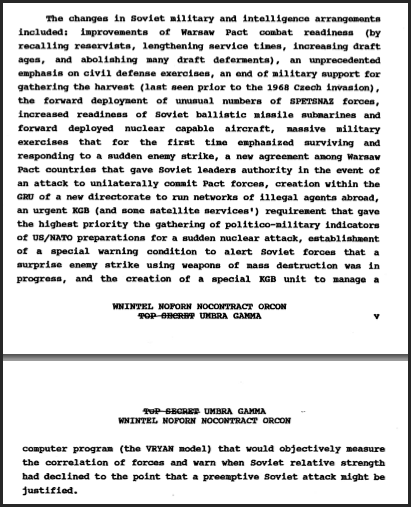 The newly released Soviet “War Scare” report – previously classified “TOP SECRET UMBRA GAMMA WNINTEL NOFORN NOCONTRACT ORCON” and published recently after a 12-year fight by the National Security Archive – reveals that the 1983 War Scare was real. According to the President’s Foreign Intelligence Advisory Board (PFIAB), the United States “may have inadvertently placed our relations with the Soviet Union on a hair trigger” during the 1983 NATO nuclear release exercise, Able Archer 83. This newly declassified PFIAB document provides the strongest evidence to date that the danger of the War Scare was real, as the only study written with access to all US intelligence files on US/NATO actions and the Soviet response in the fall of 1983. Vermeer, Johannes – Woman reading a letter – ca. 1662-1663 – back at the National Gallery of Art until December 1. 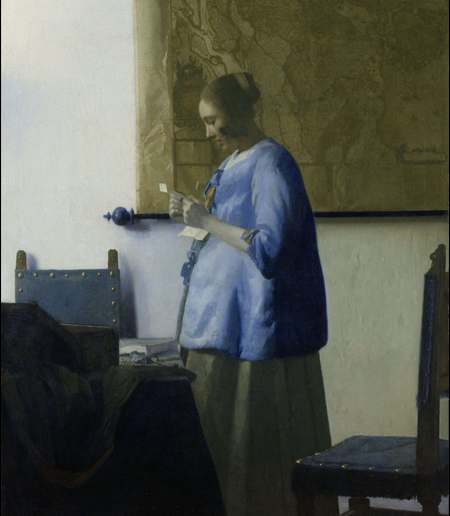 This week’s #tbt document pick is chosen with the return of Johannes Vermeer’s “Woman in Blue Reading a Letter” to the Smithsonian’s National Gallery of Art (its previous showing in 1995 was interrupted by a government shutdown). This week’s #tbt pick is a list of all the artwork acquired by the Smithsonian Institute in 2011, released thanks to a FOIA request. Want to sign up for the FRINFORMSUM email newsletter? Click here.